OK, first: If you’re new here, as a subscriber or just a visitor, welcome! And I love that shirt on you—really brings out your eyes. It seems like eons ago, but some of my clearest memories of Harry’s first weeks on earth are of me carrying him. Or Stephen carrying him. (At the time, I referred to our boy as “a very sweet, very lovable pair of handcuffs.”) The bouncy seat might buy us 20 minutes, the swing another 20, but mostly he needed to feel the warmth of a human being, encircling him. (The sling, it turned out, comforted him a little too well, to the point where he was conked out so hard we couldn’t rouse him. Cue panicked call to the pediatrician…) If you’re a parent, you know what I’m talking about. That’s why I came up with a bunch of one-handed meals—sorry, not things you can cook with one hand—simple, filling dishes you can eat with one hand, so the other one’s free to hold the baby. That admittedly unattractive little pup you see up there is one of them. 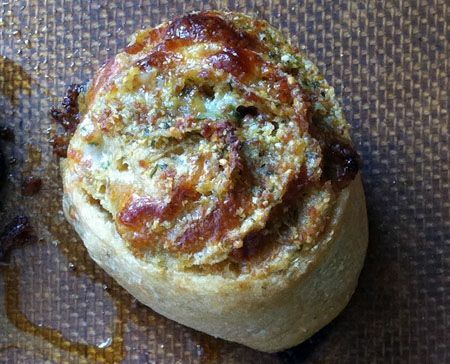 Pinwheels are a riff on Stromboli: pizza dough with stuff rolled up inside. But rather than being baked whole and sliced before serving, pinwheels get sliced beforehand. This results in something much firmer and crispier, thus easier to eat one-handed, with lots of little crunchies from melted cheese. 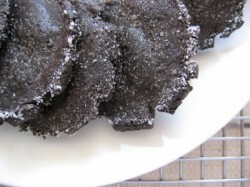 I am all about the crunch—don’t tell Stephen but when I make these, I usually delay calling him and Harry in to dinner until I’ve had a few minutes alone with the baking sheet, to nick all those little bits that, ahem, fell off. And while Stromboli usually feature sliced cheeses, meat, and vegs for filling, I whir my pinwheels’ insides in a food processor until they’re finely chopped, nearly a paste. This serves two purposes: First, it makes the pre-bake rolling and cutting much easier (no big pieces poking through the dough), and second, it makes the eating easier too (I always find that the filling sort of slurps out of a Stromboli—that won’t happen here). This particular pinwheel has pizza-ish flavor, from pepperoni, garlic, Parm, and mozz. I know, it seems unhealthy. But I use whole wheat pizza dough and turkey pepperoni, and I use a light hand with both cheese and oil. 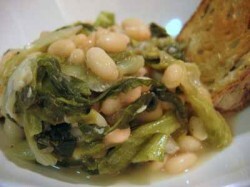 Add in the warmed-up marinara used for dunking and it’s a complete, deceptively healthy dinner. The assembly takes less than 20 minutes, and then you’ll have another 20 to relax (ha) while it bakes. Oh, and for parents of older kids: This is great for picky eaters, too, since you can spread plain sauce and cheese (or in Harry’s case, nothing but cheese and chopped olives) on a length of the dough before rolling. Just slice carefully! So, tell me: What will you put inside your pinwheels? Preheat the oven to 425°F. Line or grease a baking sheet. If your dough is refrigerated, pull it out at least 30 minutes before you start. Put the garlic, parsley, and pepperoni in the bowl of your food processor and process until finely chopped—a mini-processor works extremely well here. Add the parmesan and process again for just a few seconds, to mix it in, then drizzle the olive oil through the feeder. Process just until it clumps together. You’ll wind up with a thick paste. Sprinkle some flour onto your clean work surface, and roll or stretch the dough into a large rectangle, about 14 x 10 inches—but don’t worry if you can’t quite get those proportions, it’ll still turn out fine. And whatever you do, don’t stretch the dough so thin that holes form, or you’ll have filling leaking everywhere in the next step. Spread the pepperoni mixture over about 3/4 of the dough, leaving an uncoated portion at one short end. Scatter the mozzarella on top. Begin to roll the dough from the end with the pepperoni spread, and keep rolling until you’ve got a nice, neat log of dough. Don’t roll too tightly or the pinwheels might burst open while baking. Using a serrated knife or a pizza cutter, cut the log in half, then cut each half in half, and then cut each quarter in half until you have eight equal pinwheels. Carefully lay the pinwheels flat on the prepared baking sheet, and bake for 15 to 20 minutes, until the dough is golden brown and the cheese is melted. MAKE BABY FOOD: Friends, I’m not sure about this one. Normally I’d say to just puree a bit of the filling with broth or milk, but both pepperoni and Parm tend to be quite salty. I don’t think I’d give this to the very youngest eaters. If your baby’s a little older, simply cut the pinwheel into itty-bitty pieces. So hungry. I am so making this! I think the toddler would love it and I need more one-handed meals right now (she says while typing with one hand and a baby in the other). Let me know how it turns out, Aileen! You can really put almost anything in there, as long as it’s chopped finely enough. I think this will be a big hit at my house. I bet they would also be yummy alongside a bowl of tomato soup. Good idea, Ann! I like fleshing things out with something equally simple. Holy cow, Aileen, I totally skipped that! Thank your cousin for noticing, and apologize please. I’ve fixed it above–it gets scattered on top of the pepperoni spread before rolling. Made these tonight. Yummy! Once baked do you think they could be frozen? So glad you liked them, Theresa! Yes, absolutely, they’d be terrific frozen. Reheat straight from the freezer, on a baking sheet in a 350 oven. I’d say 20-30 minutes would do it.